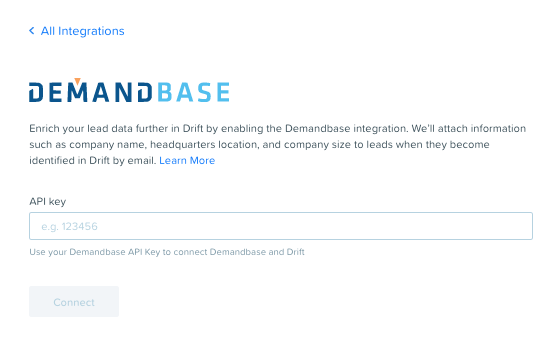 Drift's integration with Demandbase allows Drift and Demandbase customers to ultimately drive conversational ABM across the site based on Demandbase Audiences, Watch Lists, and firmographic data. In this document you can learn how to set up this integration, how the integration works, what features are included, and the available attributes/information. This integration is available on our Premium (formerly Company) and Enterprise plans. You're also required to have Demandbase's ABM Platform and an Engagement product license. Check out our pricing page to learn more about these plans. To set this up, all you need is your server-side Demandbase API Key. Make sure that you are using your server-side API key, not a client side API key. Head over to App Settings and find the Apps section. Search for Demandbase. Once you're there, enter the API Key, connect, and you're all set! We perform a Reverse IP lookup through the Demandbase API in order to retrieve the available information based on a site visitor's IP address. We also check the Audience and/or Watch List against any set targeting conditions. Below are the areas in Drift where you can use Demandbase Audiences, Watch Lists, and firmographics. Use Demandbase data to determine when the Drift widget is displayed on your site. Head to the Chat Widget section under App Settings and select Hours & Targeting. Scroll down to find the Targeting options. Demandbase firmographics can also be used to target Lead Bot, Pop Over, AND ABM Playbooks. Navigate to the Playbooks section and click New Chat Playbook to find the Playbook Marketplace where you can select templates. Under the Targeting section of the playbook editor, click on the Display option, select "Display with Targeting", and find "Firmographics"
Use Demandbase information to determine which Drift Users are routed to conversations. The Lead Routing section is under Team Settings. To utilize the integration, add "Firmographic" conditions and use the drop down to create Demandbase specific routing rules. Organizations can also use Demandbase Personalization Tokens within Bot Playbooks, Pop Over Playbooks, and Email Sequences! These work like existing Personalization Tokens in Drift - when editing a question, greeting, or the body of an email, find the icon that looks like a price tag and select the Demandbase tab. Finally, Drift will also use Demandbase to Enrich the information available on Live View, the Conversation View, and in Contacts. Here is a full list of Demandbase firmographics that can be used for Display When conditions and Routing Rules. You can also map these to Salesforce!